Another way of finding the people who blocked you is that creating a second account and searching for that user in that account. However, Facebook doesn’t endorse second (fake) accounts. If you have messages to that person at least once, you can also go to Facebook Messenger and search for his/her name. Once you find the previous conversation, try to message. If you can’t message, it means you were blocked. Another challenging way of finding out this information is that searching for the name of that person. Then compare the lists in All and People tabs. People who blocked you or deleted their profiles won’t show up in the People tab. In conclusion, all these methods are time-consuming and their results are not guaranteed. In most cases, it is hard to distinguish the people who deleted their profiles from the ones who actually blocked you. When you block someone, it automatically deletes that person from your Facebook profile as well. For more information about finding out who deleted you on Facebook, check out our detailed post: Who deleted me on Facebook? and why? Is there a way to unblock someone? If someone unblocks you, unfortunately, there is not way to lift that block. You can create a new account and send a friend request or you can communicate with that user by other ways (Instagram, phone etc.). Is there any easier and automated way? Yes! By using a simple service such as Unriended by, you can automatically get email notifications if somebody blocks you on Facebook. It takes only 2 minutes to sign up. Afterwards, you should just look for notification emails. These emails will tell you who blocked you. Additionally, they tell who your new friends are and what is your total friend count. This service pays off its membership fee quickly. Most of the customers report that they are surprised when they saw who blocked them. It helps to manage their relationships and improve their online and offline social experience. For reviews from real customer, visit their Facebook page. 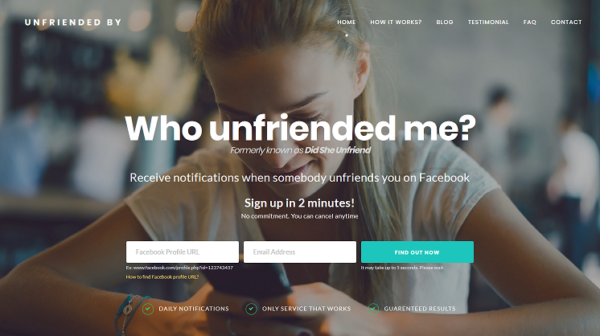 For a detailed information about finding out who unfriended you, check our other post: Who unfriended me on Facebook? Please be cautious about other sites who claim to find out who blocked you. As Facebook restricted API access to friend lists, many applications and websites had to shut down their services. Fortunately, Unfriended by still works! For a testimonial from a real customer, check this post out! Next postWho Unfriended me on Facebook? Is There an Unfriend Tracker?